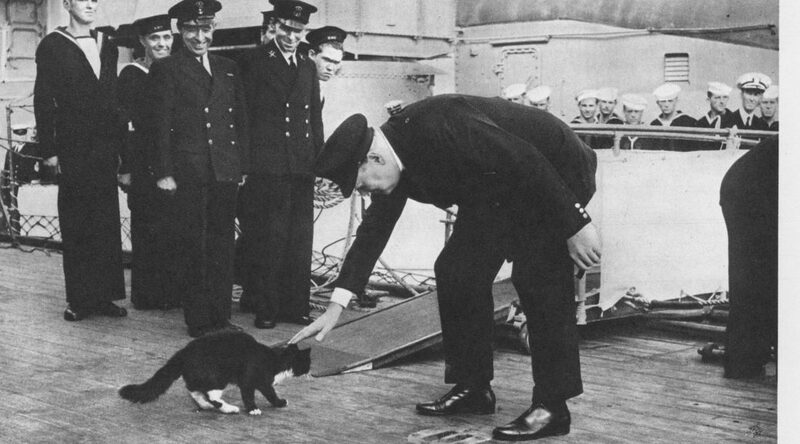 WSC with the ship’s hot water bottle, Blackie, HMS Prince of Wales, Argentia meeting with FDR, August 1941. Four months later Blackie survived the sinking of the battleship by Japanese aircraft off Malaya. Q. “Rab” But­ler, Churchill’s Min­is­ter of Edu­ca­tion (1941-45) and Chan­cel­lor of the Exche­quer (1951-55), recalled that Churchill once told him he was doing less for the war effort than Churchill’s grey cat Nel­son, who saved fuel and pow­er by act­ing as a Prime Min­is­te­r­i­al hot-water bot­tle. True?